The company was founded in January of 2000 as the sales and marketing arm of the Rootmaker® Root Branching System. In 2000, the company set up offices in Huntsville, Ala., where it continues to operate. The company has grown steadily to serve a constantly expanding customer roster. Through catalogues, trade show appearances and a website, the company markets more than 100 products ranging from plant containers to propagation products. The company also administers the RootMaker® Certified Grower's program, which certifies plants grown at commercial nurseries and tree farms using the RootMaker® Root Branching System. Dr. Whitcomb, inventor of RootMaker® Products, holds a Ph.D. from Iowa State University and was a professor at Oklahoma State University for 13 years. An expert on plant root systems, he has been published in hundreds of trade and technical magazines. He is the author of four books, including "Know It and Grow It" and "Plant Production in Containers." He holds 26 patents, including "Dynamite Crapemyrtle" and many container designs. 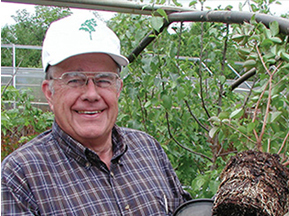 A distinguished researcher who discovered air-root-pruning, Dr. Whitcomb has received dozens of honors from groups such as the American Association of Nurserymen, the Oklahoma Horticultural Society, the International Society of Arboriculture, the Association of Garden Writers and Nursery Business Magazine. Wayne Hinton met Dr. Whitcomb more than a decade ago while operating a nursery in Tennessee. With Wayne handling the marketing aspects, the two forged a partnership that led to the creation of RootMaker®. Dr. Carl E. Whitcomb received his Ph.D. in horticulture, plant ecology, and agronomy from Iowa State University in 1969. He was a professor at Oklahoma State University 1972 - 1985, then began his own horticultural research company, Lacebark Inc. Root constriction pruning grew from a chance observation in 1967. He was the first to perform air-root-pruning in 1968 using milk cartons with bottoms removed. This eventually lead to RootMaker®, RootBuilder®, RootTrapper®, and Knit Fabric In-Ground Containers. Accomplishments include: four books (Plant Production in Containers II, Production of Landscape Plants II (in the field), Know It and Grow It III, and Establishment and Maintenance of Landscape Plants II), 26 patents (container designs, Dynamite® crapemyrtle, etc. ), papers published in several hundred journal and technical publications, and numerous nursery industry awards.